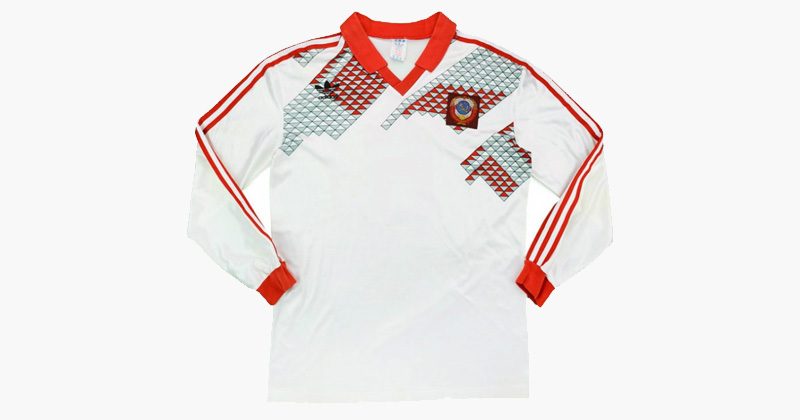 The next stop on our grand tour of Italia 90 kits sees us looking at one of the more unique groups of this World Cup. Reigning champions Argentina, the fresh and exciting Cameroon, Romania (admittedly the most ‘boring’ team in the group) and what would become the last tournament for the 1988 European runners-up, the Soviet Union. 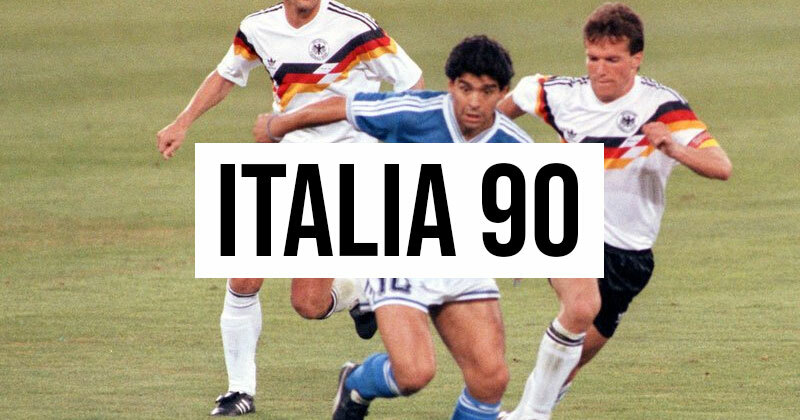 With 3 teams advancing from this group, we have a long article ahead of us, so sit down, grab an espresso and an amaretto, and join me in our look at the teams and kits of Italia ‘90 Group B. 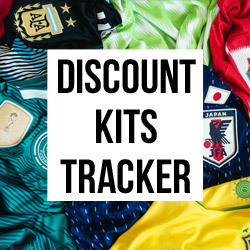 Image from Football Shirt Culture. I suppose it’s almost fate that the Soviet Union’s last World Cup (before the fall of communism) would also see them finish in last place in Group B, being the only team not to qualify for the knockout rounds. Their opener versus Romania resulted in a 2-0 loss, not an inspiring start to their campaign. This was followed up 4 days later by another 2-0 loss, this time to Argentina. By this point qualification was impossible, and sadly a 4-0 triumph over the group winners Cameroon wasn’t enough to save them. Crazy to think that just two years earlier at the 1988 European Championships, the Soviet Union would finish as Runners up, considering their dismal performance during Italia 90. This was the end of the Soviet Union’s World Cup history, but just 4 years later Russia’s story would begin. Starting with the Soviet Union’s home kit, what a mess. That grey, white and red design is not aesthetically pleasing at all and seems randomly thrown across the front of the kit. Whilst I appreciate the effort to be unique, this falls flat on its face. If the pattern had ran further down the shirt it could have looked more interesting and pleasant, but instead it falls short. Very short. The away shirt is marginally better. The red collar and neckline are decent and is a nice contrast to the white background. The pattern also suits this colour scheme a little more and looks much less busy and cluttered than the home shirt. An improvement. Sadly, the little red box around the Soviet Union badge sticks out like a sore thumb, ruining the pattern it’s on. Overall a poor set of kits. Shockingly, world champions and eventual finalists Argentina only managed to finish 3rd in the group, an incredibly disappointing start for the South Americans. With an unprecedented loss against a nine-man Cameroon in their opener, amends had to be made, and they were marginally with a 2-0 win over the Soviet Union, before a relatively disappointing 1-1 draw to Romania leaving them in 3rd place. However, as one of the best 3rd placed teams, they were lucky to qualify for the knockout rounds, and what a run they would have. Their Round of 16 game was against Brazil, and it seemed likely they would fall at this hurdle. However, they didn’t. They won, 1-0. It was a close and tightly fought battle, but a win nonetheless. Moving on to their Quarter Final game against Yugoslavia, neither team could hit the net during regular or extra time, and so it went to a penalty shootout. Despite Maradona’s miss, Argentina won 3-2, moving them forward to the Semi Finals. 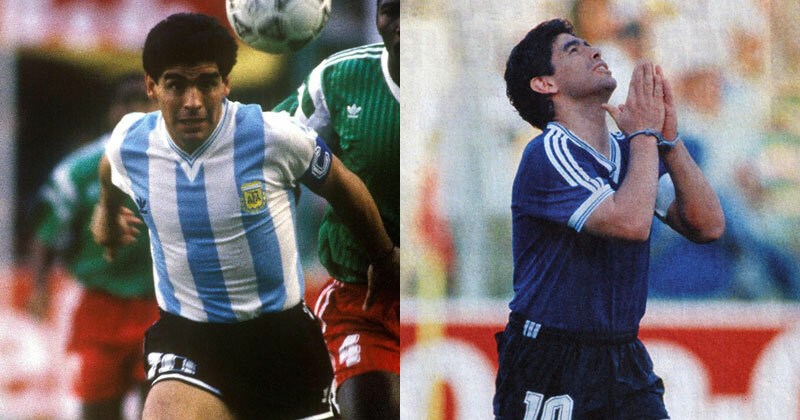 As previously discussed in the Group A article, this game would be an important game culturally for Italy and for Maradona as a player and a person. On that fateful July night in Naples, Caniggia equalised for Argentina and left the game drawing at 1-1, meaning penalties would be the decider. This night, as we know, ended well for Argentina, with Maradona scoring the winning penalty, pushing them to the World Cup finals against West Germany. The final against West Germany has often been described as “the most ill-disciplined” final ever, with Argentina going down to 9 men and losing to the solitary goal of Brehme’s penalty in the 85th minute. This was the first final to feature a rematch in a back to back World Cup finals (with Argentina triumphing over West Germany 4 years earlier), the first final to have a red card (Argentina impressively getting two), and the first final where a team failed to score (something that would become more common over the next 28 years). Let’s move on to a more positive note, the kits. Argentina’s home kit features the must-have components, with the sky blue and white stripes running down the shirt. 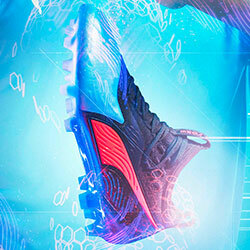 Adidas did a great job of applying the age old saying of, “if it ain’t broke don’t fix it”. It’s a classic shirt, and the sky blue triple stripes running down the sleeves and around the neckline fit perfectly, not looking out of place in the slightest. Whilst not straying too far from what's expected of an Argentina home kit, it still looks good, and seeing Maradona sprinting down the pitch wearing this shirt just feels right. Plus, using the colours of the flag in the national team kit is something I’m very fond of, so I’m happy to see it here. The away shirt is also a tasty sight, with the darker navy blue fitting perfectly with the white and sky blue trim found on the sleeves and neckline, again incorporating the flags colours on the shirt. The deep shade of blue is a nice contrast to the home shirt, and yet still falls within the team’s identity, making this one of the nicer away shirts Argentina have had in the last 30 years. Second placed Romania is a side often remembered on the wrong side of history in this World Cup. Despite a decent showing in the groups, they are more often remembered for their Round of 16 game against the fan favourite Ireland, and so not much attention is ever paid to how they actually performed previous to that game. This was one of the two tournaments that one of Romania’s greatest ever players, Gheorghe Hagi, played in, and so is an important stage in the history of the team. Let’s have a quick run through, and see how they did. First, they watched reigning champions Argentina fall to Cameroon, something that could have only inspired hope in the team, and so they carried that to their opener against the Soviet Union, a game they won handedly 2-0, a result even more impressive considering the lack of Hagi. 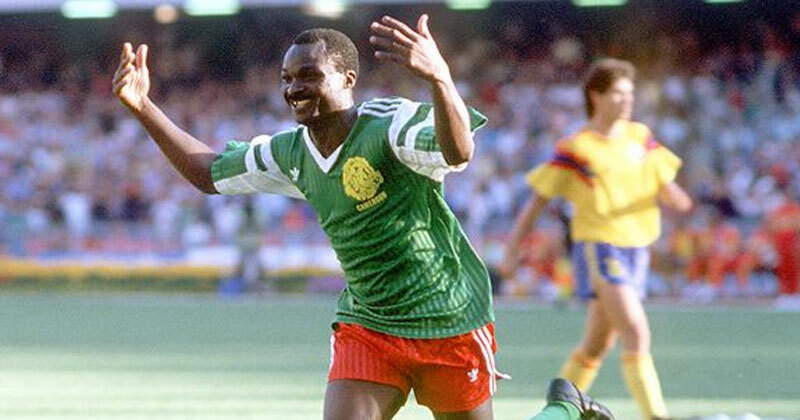 Against Cameroon in their next game, they fell victim to the old magician Roger Milla, who scored twice against them handing them a 2-1 loss. Needing a point to qualify their final game was against the warmed-up Argentina, but a tight 1-1 draw was enough and they secured second place. Ireland. Their Round of 16 opponents, and a team not many thought would even get out of groups. It’s likely that Romania thought that, after a decent performance in the group stage, Jack Charlton’s Ireland would present little trouble for the side, but football is never played on paper. 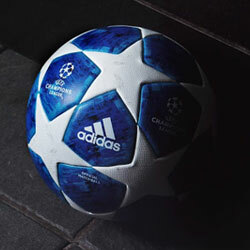 A defensive and slow 0-0 game took place, having to be decided by a penalty shootout. Only one penalty was missed or saved, but sadly for Romania it was their man, Daniel Timofte, whose penalty was saved by Irish keeper Packie Bonner, and that was it. 2 more World Cups in the 1990’s would follow this “golden generation” team, with 1998 being the last time they qualified for the tournament to date. Wow. Both kits are lovely, but we have to start with the home shirt. The primary yellow colour is added to by the contrasting sections of red and blue, all 3 colours making up Romania’s tricolour flag. 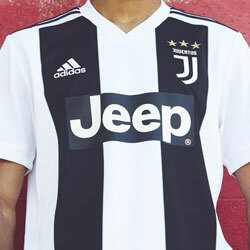 Adidas did a wonderful job incorporating the stripes too, using the different colours on the shirt and on the shorts. The red primary trim works in tandem with the blue secondary trim, as it allows the blue to dominate the shorts without overpowering the red entirely. The away kit doesn’t disappoint either, this time using red as the primary colours on both the shorts and the shirt, relegating blue to only being underneath the sleeves. The yellow trim on the neckline and the triple stripes look fresh, and give the shirt a positive and memorable look. The only negative is the conservative usage of the blue, something I would have liked to have seen used a little more. However it doesn’t take too much away, and both kits are absolutely lovely. Ahhhhhh. The shock group winners. Cameroon. Defying all expectation they had a much more successful World Cup than anyone expected, and could have gone further if it wasn’t for Gary Lineker's physical weakness when in the box. This was the first tournament an African team had gone further than the group stage, and with their aging talisman Roger Milla, they left the world speechless with their play and Milla’s swinging hips by the corner flag. What hasn’t been said about Cameroon’s opening game against Argentina? Physical, rudimentary, and yet captivating, the nine men of Cameroon managed a huge upset straight out of the gate, beating the world champions of 1986 1-0. Proving it was not just a fluke victory, they beat a solid Romania 2-1, guaranteeing qualification to the knockout rounds. Maybe because of the lack of pressure, they took their foot of the gas for the final game, somehow being thrashed by the last place Soviet Union 4-0, however this didn’t stop Cameroon from finishing top of the group. Colombia was the opponent in the Round of 16, and it was a good game, finishing 0-0 in regular time, but with 3 goals being scored in the 30 minutes extra. Luckily for Milla and Cameroon it was their 2 goals (Milla scoring both) that saw them move onwards to the Quarter Finals match against England. This was the first knockout game an African nation had ever won. An unlucky Quarter Final would follow, with Cameroon outclassing England throughout, winning 2-1 for the majority of the game, until the 83rd minute when Gary Lineker was given a relatively weak penalty, pushing the game to 2-2. In extra time, Lineker did it again, and Cameroon were out, losing 3-2. Despite that, this tournament was a huge success for the side, and for African teams in general, helping the region to gain some exposure, confidence and respect from the footballing world. Maybe I’ll get some flack for this, but I’m not a fan of the home shirt. The light/dark green stripes running down the shirt aren’t contrasting enough to be interesting, but not subtle enough to be subliminal, leaving the shirt in a weird sort of limbo. The white secondary colour is marginally more interesting, and I like what Adidas have done with the sleeves, however it's not enough to save the shirt in my opinion. Whilst its not the most offensive shirt, it’s definitely not interesting enough to go down in history. The away shirt is definitely the better of the two, with the green trim nicely adding to the bright yellow primary colour, both colours being found in Cameroon’s flag. The badge also looks better matching the secondary colour, something the home shirt didn’t manage to achieve. The disappointing light/dark stripes are here too, but for some reason I find them less boring, maybe due to the lighter colour. 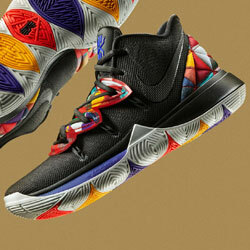 Again though, it’s not a kit that sticks in your memory, and definitely one that will be forgotten about in time. To conclude this retrospective look at Group B in the 1990 World Cup, it’s definitely an interesting set of teams. With the World Champion, the 1988 European Runners up, and 2 smaller teams, it’s incredibly interesting how this group eventually played out. The groups layout was infinitely more interesting than the kits, with this group having much weaker kits overall when compared to Group A. The 2 kits I’d carry from this group are the Argentina away shirt, and the Romania home shirt, both of which are lovely shirts and deserve to be looked back at fondly.